Meet Dr Brent Woolverton, O.D. at TSO in Tomball, TX. Home » Our Doctors » Brent Woolverton, O.D. 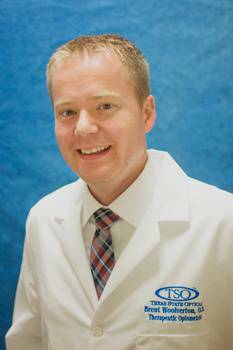 Dr. Brent Woolverton is a native of Houston, graduating from Westfield High School in 1997. He moved to the Tomball area with his family in 2010. Dr. Woolverton obtained a Bachelor of Science in Biology Degree from the University of Houston. He then went on to receive his Doctorate of Optometry from the University Of Houston College Of Optometry. In addition to being a licensed Therapeutic Optometrist, Dr. Woolverton has met the qualifications necessary to achieve the title of Optometric Glaucoma Specialist at TSO. In his spare time, you might see Dr. Woolverton on the golf course or out at the movies with his family. He loves Sci-fi, Action and Comedy movies. Dr. Woolverton thoroughly enjoys watching the Texans, Astros and Rockets. Is this their year for 90 wins? Dr. Woolverton is the commissioner of the UHCO class of 2013 fantasy football league. Married over 15 years, with two boys and one girl, he is always keeping busy! He has a cat named Smokey. Dr. Woolverton and his family love to go bowling, play laser tag, video games, go to all sorts of sporting events and enjoy playing board games. Their favorite vacation spot is Pensacola, Florida.